"UFOs" Made Up of Light-Balls? @ 12:29 am, "Cyclops" event field. 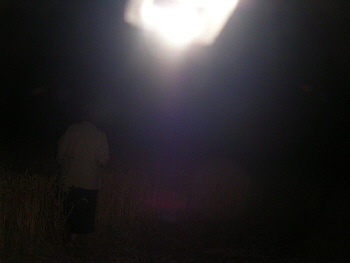 On the last night of Dr. William Roll's visit with us in Hoeven we had all stayed out in the fields until it had gotten quite cold. After driving Dr. 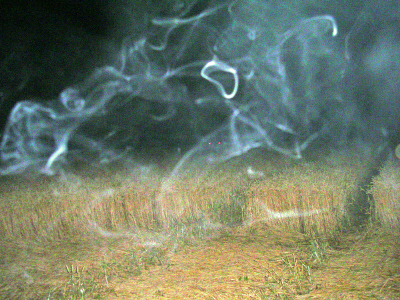 Roll to his hotel at around 11:30pm Robbert and I went back out, this time to a field where a year or two previously Robbert had experienced an encounter with a very large, solid-looking, landed craft and two extremely tall, one-eyed beings -- an event so strange that he was certain he had "dreamed" it until the next day, when he and his father returned to the field and found the clear imprint of both a large flattened circle and multiple very long "footprints" in the grass, exactly where Robbert "dreamed" he had experienced the event the night before. I had never asked Robbert to show me this field before, but for some reason I suddenly wanted to go there after dropping Dr. Roll at the hotel. As soon as we arrived Robbert said he could feel that an "energy" was present and asked to use my camera. The following photos are just a few of those Robbert took that night -- this time with my camera (to which he has no access unless I open the case and hand it to him), and with me present and paying attention. 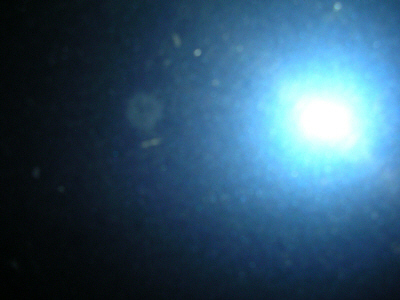 Are these images of a UFO? Or of a "light-ship" of some kind? 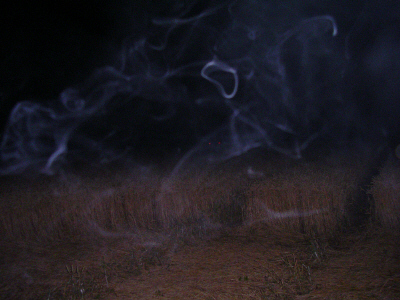 Neither Robbert nor I saw anything with our eyes but, whatever this was, it appeared over and over in the photographs. a few years earlier. Photo: N.Talbott. and Robbert took "UFO" photos with my camera. 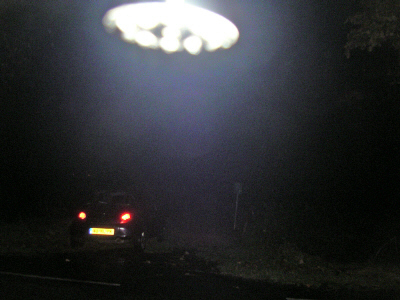 October 17, 2008, 12:30 am, 2nd shot of the "UFO" over our car (top). so that location of car on brick pull-out is clear. 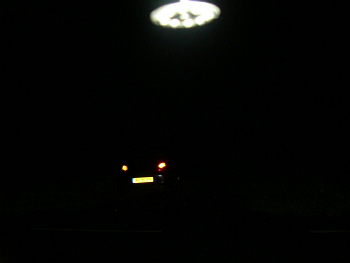 Here the "UFO" appears to be a little higher over the car, and smaller. in which Robbert saw craft years earlier. 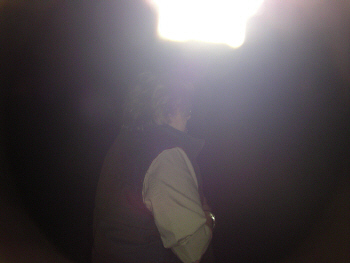 Robbert took many more photos of this "UFO" that night, all within about 10 minutes, and these were followed by another whole series of bizarre images which will have to wait for another report. 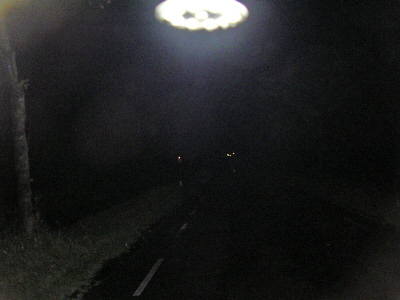 In August, 2007, during my Holland trip that year, a rectangular light-object appeared on my camera for the first time. We were out in the fields not far from Hoeven, walking alongside a field planted with maize. 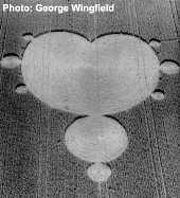 I had been hoping that a crop ring would appear in maize during my stay in Holland and was focusing intently on communicating this desire to the "consciousness" I increasingly feel must be involved in the events around Robbert and, most likely, in the crop circle phenomenon generally. As usual, Robbert and I were taking photos from time to time. No new crop circle appeared. 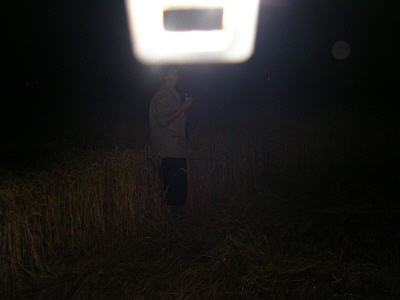 But during the precise time I was silently "wishing" that a maize circle might occur before I had to leave, Robbert took a series of photos aiming the camera first down along the path alongside, and then out over, the maize field. 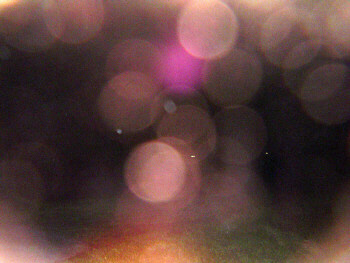 August, 2007 - first shot shows only big pink & orange "light-balls." 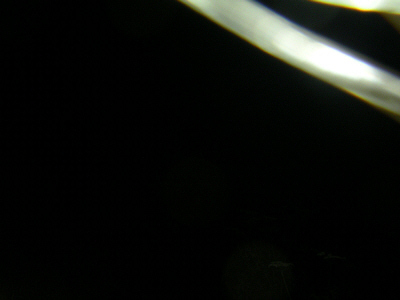 on my camera; object seems to incorporate multiple small light-balls. to be small, moving, light-balls inside them. August, 2007 - 4th shot. All 4 photos taken only seconds apart. 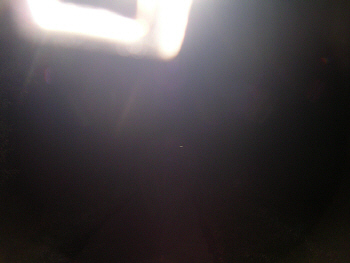 The rectangular light object appeared again, in October, 2008, on one of our excursions to Robbert's "special " field (the location where as a young boy he first watched as multiple light-balls revolved around each other out over the field and, then, approached him). This time it was photographed repeatedly. 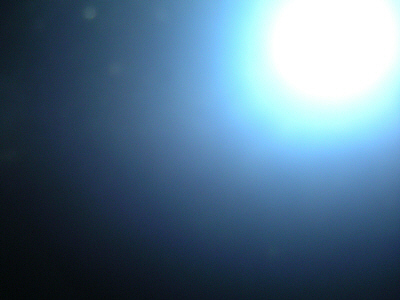 In the first photo in this series there is a hint of the aquamarine color present the year before and, again, a suggestion of many small, moving, light-balls within the object. 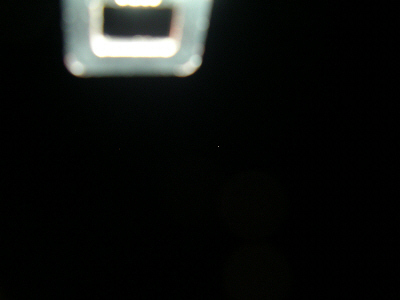 But this time the rectangle is much brighter and, as Robbert continues shooting, the object becomes totally white. 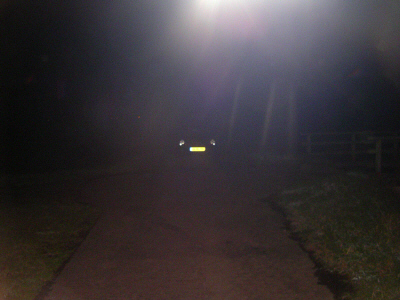 Spot where we park our car & pathway next to Robbert's "special" field. 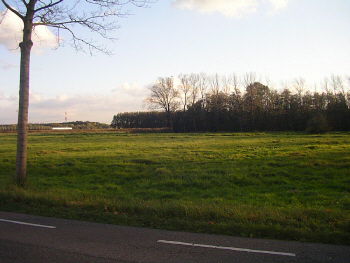 "special" field (not far from the 2007 maize field). In the first shot Robbert is aiming the camera back toward our car, parked in our usual spot next to the bridge, about 30 ft. away. 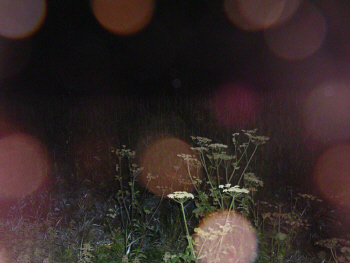 He then turns the camera in the opposite direction, aiming down the path bordering the field, and in this 2nd photo the object appears closer and is now all white. 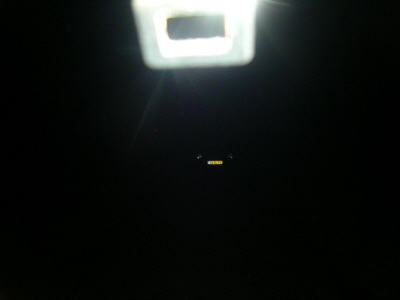 From all of these photos it appears that the object is close to, and slightly above and in front of, Robbert's head. 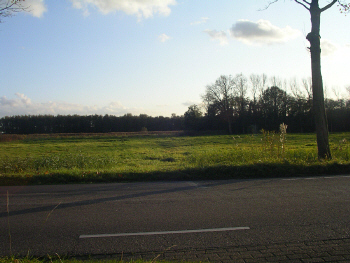 from car & down path beside "special" field. path is visible all the way to the car. photos (top), then becomes squared again (bottom). 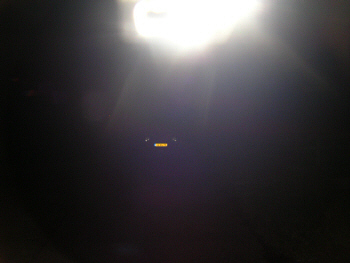 In 2009 what looks like this same object appeared in Robbert's photos again, multiple times, during our first visit to the crop circles at Standdaarbuiten. 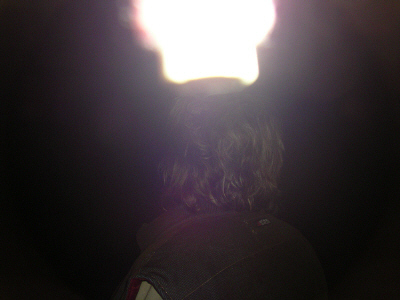 In these first shots there is just a bright light up over my head, out of the frame. Next the light takes on a shape somewhat like a trumpet or upside-down funnel and then becomes the by-now-familiar rectangle. In one photograph it appears to actually be touching my head, although I felt nothing unusual. 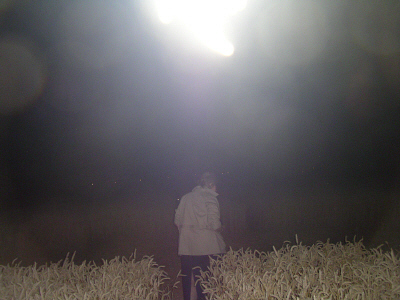 July, 2009 - Nancy & light in Standdaarbuiten crop circle field. 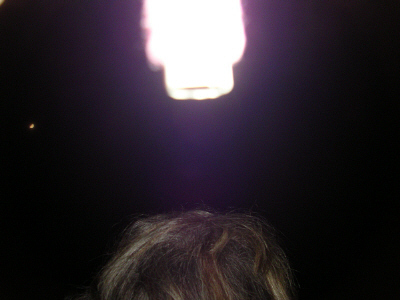 July, 2009 - Rectangular light now appears to be touching Nancy's head. July, 2009 - As in 2008, the shape changes from photo to photo. (original photo, top; with "autofix," bottom). Back in 2008, and again at the "special" field (but on a trip after the rectangular object had been photographed), Robbert and I were discussing color. 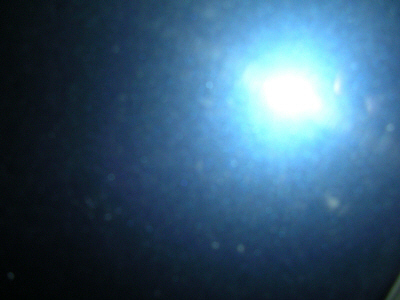 I was expressing delight with the aquamarine color in the first rectangle photos while Robbert was drawn to the lovely blue color he often "sees" when he perceives a "Mary" (Virgin Mary) energy (see 2007 report: http://www.bltresearch.com/eyewitness/eyewitness8.php). We weren't arguing, but both of us were advocating these two different colors. 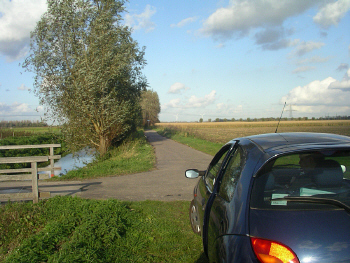 After talking for awhile in the car, we both got out and began walking together along the path at the top of the dike. Suddenly Robbert asked if he could use my camera, because he felt an "energy" present. I handed it to him and both of us were flabbergasted to see what appeared in the photos: over and over, dazzling displays of exactly the colors we had just been discussing. And although we can think of no way to prove this, we both sensed that this "consciousness" which so regularly intimates its presence was not only aware of our discussion, it was deliberately reflecting its awareness (and, thus, its presence) back to us. I still can't wrap my mind around what happened that night. Standing out on the dike with Robbert it seemed utterly impossible to me, totally outrageous. 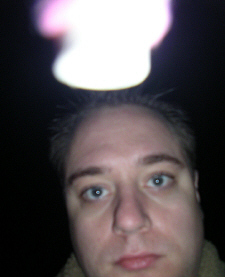 But I was right with Robbert in the brisk night air as he took the photos and I saw them immediately afterward. And I know what we had just been talking about. colors we were discussing that night. at which point the light-balls look larger. photos; in some (bottom), the light balls are not so apparent. 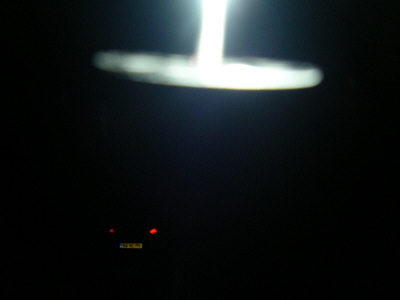 During 2008 Robbert took a wide range of anomalous photos with my camera. 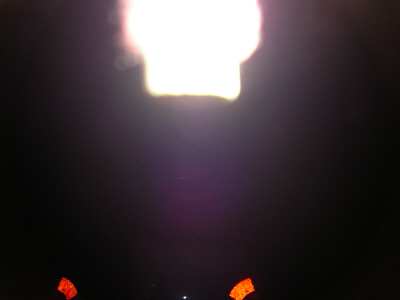 Among the other strange images was a whole series of what looks like a structured light-object (a UFO?) of some kind -- often appearing right over, or on, Robbert's head, or on or over our car or me. this one right over our car. next to him & did not see light. 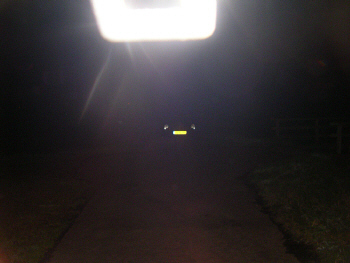 the rectangular light in other photos. or is actually (bottom) touching Nancy's head. 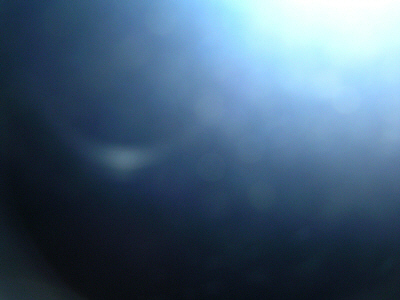 October, 2008 - Light-ball photo taken during above sequence. Are these variously structured objects UFOs? None of these were observed visually and most don't have shapes people associate with UFOs. 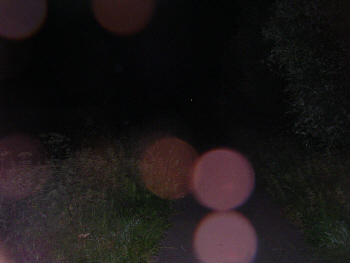 But these photos all show at least partially-structured, lighted, aerial (and moving) phenomena. 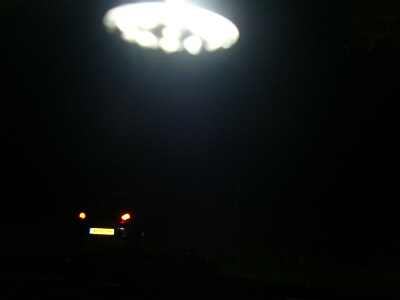 Does the fact that they could be seen only with the help of a camera rule out the possibility that they are UFOs? Again, Robbert thinks these photos (and the more typical "UFO" images he captured in 2009, in the next section) are most likely "projections" of a spiritually-based "cosmic" energy -- an energy which can take any form it desires and manifest in multiple ways. 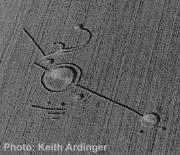 He wonders if the more "traditional" 2009 "UFO" images appeared simply because they represent already-prevalent ideas of what other-worldly or inter-dimensional realities might look like. In other words, images that people would be likely to identify as "not of this world."